Hillary Clinton may have made history as the first woman to be nominated for U.S. president by a major political party, but some in the Bay Area remain unconvinced of her ability to lead the nation. Young citizens gathered in San Francisco Thursday to watch the final night of the Democratic National Convention. Many, however, support Bernie Sanders and plan to pass out T-shirts and stage a silent demonstration. Alan Swislow, co-leader of the Contra Costa for Hillary club, said he saw Sanders supporters “turn their backs on one of the speakers” during the four day-long event at the Wells Fargo Center in Philadelphia. He didn’t think they planned to behave the same way Thursday. Swislow believes that speeches given by President Obama, First Lady Michelle Obama, and former President Bill Clinton, have helped Clinton make her case. But it was Sanders who probably did the most to convince his supporters to throw their weight behind Clinton, he said. “I’ve got a friend of mine today who is a Bernie person,” Swislow said. Meanwhile, Amador City Mayor Tim Knox told NBC Bay Area that the DNC hadn’t revealed anything new about Clinton that would encourage him to support her. Knox said he planned to listen to her speech Thursday before deciding whether she has his trust. 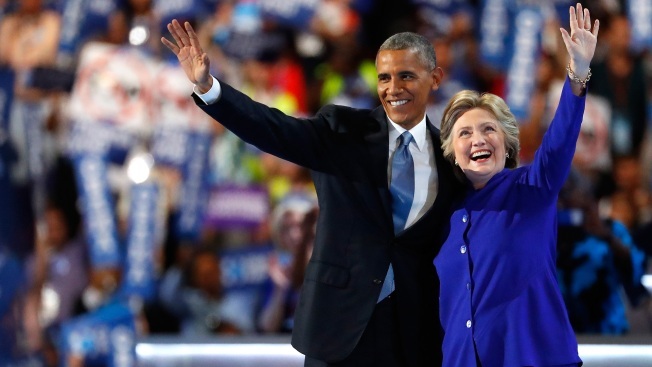 Political experts predict that Thursday will be a challenge for Clinton, who must now top Obama’s address, which many are touting as one of the best convention speeches they’ve ever heard. After receiving the number of votes needed to secure the Democratic party's nomination, voters are now looking to Clinton to walk the line between promising to finish what Obama started and being a change-maker willing to shake things up, pundits say. “I want to ask you to reject cynicism and reject fear and to summon what is best in us,” Obama told attendees Wednesday.